We usually do not think of winter as of an allergy season, and cold temperatures may often bring temporary relief to people allergic to pollen. However, spending more time indoors, as people usually do in the wintertime, can mean more problems with dust mites, pet dander, cigarette smoke, gas fumes, and household chemicals. Weakened immune system is vulnerable to different kind of irritants. If the person is allergic, his body produces histamine, an organic nitrogen compound involved in local immune responses. Histamine triggers the inflammatory response in the body causing the itching and swelling when the person is exposed to allergens. Any kind of persistent sniffing and sneezing during the winter months could actually indicate that person is allergic. During the winter, people tend to spend a lot of time indoors in the heated rooms. Heated air circulates around the living spaces, naturally moving upwards. As the hot air rises it carries the dust, mold spores and insect parts into the air. People breathe the very same air and the particles are getting into the nose, triggering the allergic reaction to those who are sensitive. Allergic reactions occur as a reaction to normally harmless environmental substances. Many winter allergens such as dust or pollen are airborne particles, and symptoms of these allergic reactions arise in areas in contact with air, such as eyes, nose and lungs. 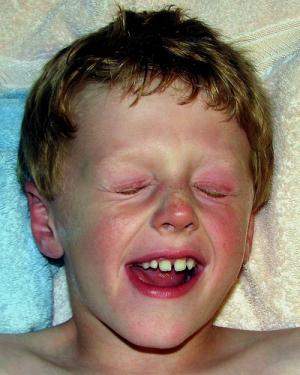 The most common symptoms are irritation of the nose, sneezing and itching and redness of the eyes. Asthmatic symptoms and narrowing of the airways are also present. Patients may also notice increased production of mucus in the lungs, shortness of breath, coughing and wheezing. Dust mites – small insects that cannot be seen without a microscope. Dust mites feed on skin cells shed by people. Dust mites need warm and humid environments like bedding, upholstered furniture and carpeting. Mold - mold allergy is associated to asthma and prolonged exposure to mold causes restricted breathing and other airway symptoms. If the indoor humidity is higher than 60 percent, people may be exposed to mold in their homes. Mold usually occupies dark and moist places like basements, behind walls in framing, on soap-coated grout and other damp surfaces. Pets – most of the people with allergic reaction to animals are allergic to protein found in dead skin flakes, saliva and urine. When the protein is inhaled it reacts with patient’s immune system causing the series of allergic symptoms. Do side effects of Mylanta includes allergic reactions?